This 30-second exposure of a Perseid meteor was taken on Aug. 12, 2016, with a circular fish-eye lens in Spruce Knob, West Virginia. Wondering how to capture the beautiful, ephemeral streaks of a meteor shower? Just in time for the Perseids, which peak this weekend (Aug. 11 to 13), here's a rundown by NASA of the best ways to photograph the phenomenon. 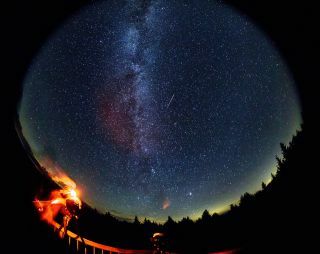 Skywatchers are looking forward to this year's Perseid meteor shower, which can be best viewed after 2 a.m. at your local time on Aug. 11 to 12 and Aug. 12 to 13. Because the moon is a slim crescent and sets early, the dark skies will spotlight the peak's 60 to 70 meteors per hour. NASA also suggests using a tripod, because you need long exposures to capture a meteor's path across the sky. A heavier tripod can help reduce shaking, but you can also support a lighter tripod with sandbags to make it more stable or prop up your camera on something else if you don't have a tripod available. When you're watching a meteor shower with the naked eye, it's best to lean back and look at the whole sky, and NASA's camera recommendation reflects that: Use a wide-angle lens. Meteors can appear all across the sky, and a wide-angle lens instead of a telelphoto lens means it's more likely to be in your field of view. To keep the camera from wobbling, NASA also suggests using a self-timer or shutter release cable to start your shot rather than pressing the camera button yourself. It may also be possible to activate the camera with a mobile device, if your camera has Wi-Fi, officials added. A 10-second exposure reveals a meteor from the 2016 Perseid meteor shower streaking through the sky above Washington, D.C.
You should also be sure to manually focus your camera — autofocus will have trouble fixing on the night sky. NASA suggests taking test images of stars lasting a few seconds each and fine-tuning the focus based on how they look (fuzzy blobs mean you haven't focused correctly). Some cameras might have a zoomable electronic viewfinder or live-view option that lets it automatically zoom to a star and focus. Meteors can appear all over the sky, but generally, they seem to emanate from one point, called the meteor shower's radiant. (For the Perseids, that source is the constellation Perseus.) Aiming your camera toward that point makes it more likely that you'll pick up meteors, NASA said. "Take 500 and divide it by the length in millimeters of your lens," NASA officials said in the post. "The resulting number is the length of time in seconds that you can keep your shutter open before seeing star trails. For example, if you’re using a 20 mm lens, 25 seconds (500 divided by 20) is the longest you can set your exposure time before star trails start to show up in your images." A 20-second exposure shows a meteor in the sky on a mountain ridge near Park City, Utah. Though it was taken during the Perseids, this meteor is probably not from that shower, because it doesn't originate from the right part of the sky. After choosing your maximum exposure time and setting your shutter priority to that length, NASA said, you can try some test shots and let the camera calculate the other settings for a test shot. If it's too dark, adjust the aperture to a lower number and the ISO to a higher number for next time — adjusting settings one at a time will let you get the image you want. "With your camera settings adjusted, capturing that perfect photo is just a matter of time and luck, NASA said. "The highest rate of meteors visible per hour is in the hours after midnight and before dawn. Set up your camera next to a lounge chair or a blanket to witness the wonder of a meteor shower for yourself — and, with any luck, you'll take home some envy-inducing shots, too!" Editor's note: If you snap an awesome photo of Perseid meteors that you'd like to share with Space.com and our news partners for a potential story or gallery, send images and comments to spacephotos@space.com.